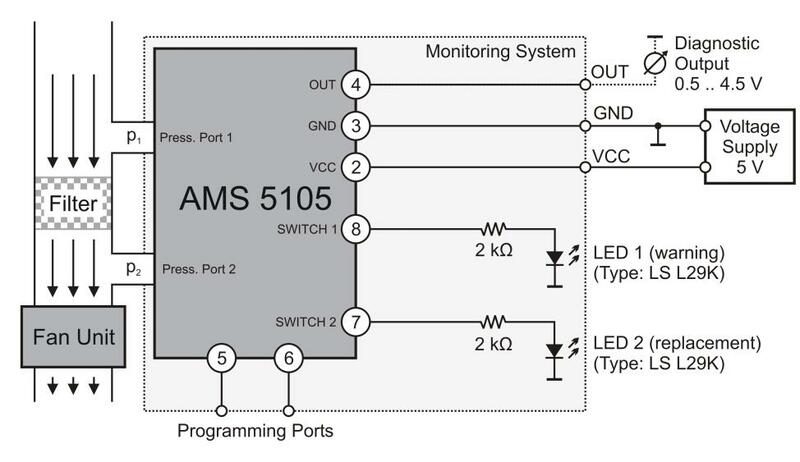 Analog Microelectronics has an application note discussing how to monitor HVAC fan and filter performance using the AMS5105 pressure sensor. The AMS5105 is a board-mount, compensated and calibrated pressure sensor with an analog ratiometric 0.5 to 4.5V output along with two discrete, programmable logic switching ports. For each switching port, the switching function, threshold, hysteresis and delay can be set individually. Having low differential pressure calibration from 100 mbar down to 5 mbar, the AMS5105 is ideal for fan and filter monitoring systems. Simple HVAC Filter Monitoring System With Pre-Warning - Here the switching ports are programmed as normally-open and hysteresis is set to 5% of the calibrated pressure range. HVAC Filter Monitoring System with a 24V Supply and Robust Outputs - Similar to the first example but includes details what to do if only 24VDC is available as a supply. HVAC Monitoring System with Diagnostics Measured at an Orifice - Similar to #2 but measurement is taken across an orifice to protect the sensor from contaminants. As you can see, this application note gives great details on how to use the AMS5105 for HVAC filter monitoring. We hope you find it as a useful tool that can be applied across many different applications. Different methodologies exist for creating leak detection systems. In this blog post, we will focus on leak detection using a pressure decay method which is ideal for detecting very small leak rates. 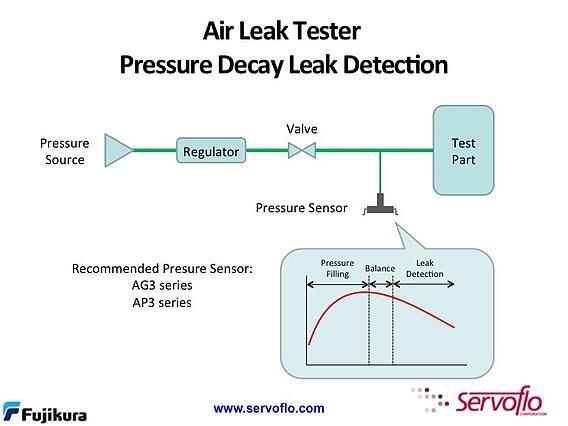 The diagram below illustrates a classic leak detection setup using pressure decay. The test part is pressurized from a pressure source. At the first X under "Balance" in the chart above, the pressure setpoint is reached and balance is maintained until the leak detection test begins at the second X. The regulator and valve isolate the test part from the source once pressurization is complete. The pressure sensor monitors and measures the pressurized test part. If the pressure measurement decreases, then air is leaking out of the test part. Measuring the change in pressure over a period of time allows the user to calculate the leak rate. The availability of easy-to-use, sensitive pressure sensors at low cost lets designers optimize their leak detection design. The AP3/AG3 Series is an example of a pressure sensor well-suited for leak detection applications. The AP3/AG3 is a calibrated and temperature-compensated pressure sensor with ranges from 0-25 kPa up to 0-1000 kPa. Not only does this sensor have high accuracy of ±1.5% full-scale, the AP3/AG3 has built-in threshold detection (consider how easy it is to set the threshold for the start of the leak test). The AP version has a dual-in-line package while the AG version is surface-mount. With a price of of approximately $7 (depending on the model) at 1,000 pieces, the AP3/AG3 provides has an excellent price-performance ratio. An oxygen concentrator is a medical device to deliver oxygen to a patient. A typical concentrator consists of a compressor, absorption columns with air filters, circuitry, a product tank and regulator. Oxygen concentrators differ from machines delivering compressed oxygen from tanks filled at a separate location. Instead, an oxygen concentrator takes standard room air, filters out the nitrogen and other gases, leaving oxygen to be delivered to the patient. The block diagram shows a design of a typical oxygen concentrator. Pressure and oxygen sensors are used at various points to ensure proper creation and delivery of oxygen. For example, a pressure sensor is used at the product tank to measure the tank's level and to ensure there is proper flow moving into the regulator. Often times there is also a pressure sensor between the regulator and outlet oxygen. A stationary oxygen concentrator may use a pressure sensor in the 50 kPa r ange to detect a kink in the tubing. 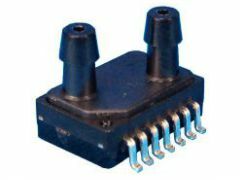 (See AP2/AG2 analog pressure sensor or AP3/AG3 pressure sensor with threshold detection). For portable oxygen concentrators, a pressure sensor in the 1 kPa range is used to detect inhalation which then controls the regulator. Here, it is important to use a pressure sensor that is sensitive enough to detect the low flow rate of breathing but can also withstand high overpressures. The AL4 is a good option meeting this requirement. Finally, and perhaps most obviously, an oxygen sensor can be installed to sense the oxygen percentage of the air being delivered to the patient. 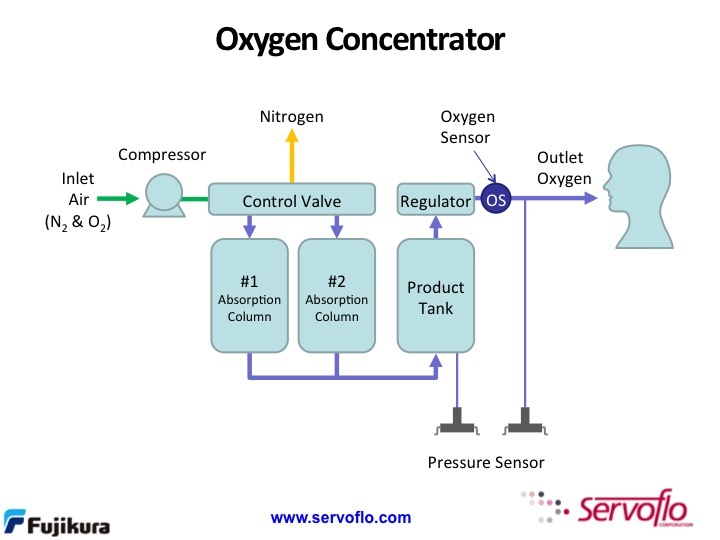 The oxygen sensor allows the designer to create alarms and set points for the filtering portion of the concentrator. The abundance of sensing technology has allows for the development of more flexible medical equipment with more features and functionality. This description of oxygen concentrators is one example of where the evolution of technology has created better health for all. Continuous improvement in MEMS pressure die has allowed for the development of ultra low pressure sensors in small packages. Fully calibrated and compensated, these pressure sensors can measure as low as 0.07 psi (5 mbar), and come in gauge or differential packages with an I2C output. Here are some examples of ultra low pressure sensors now available. SM9543 - Differential pressure sensor wtih ranges as low as±0.07 psi (±5 mbar), I2C interface, 3 - 3.6V power supply, accuracy of ±1.5% full-scale. JEDEC SOIC-16 package (about 10 mm x 10 mm). Temperature compensated from -5°C to +65°C. Burst pressure of 3 psi. SM9541 - Similar to SM9543 with slightly higher pressure ranges from 0.14 psi up to 2 psi. Gauge and differential available. Burst pressure varies with calibration range from 3 psi up to 15 psi. 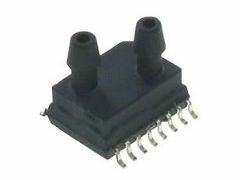 AL4 - Gauge pressure sensor for 0-20 mbar (0-2 kPa) up to 100 mbar (10 kPa). I2C interface, supply voltage options of 3V, 3.3V, 5V.±1.5% accuracy. High load pressure of 100 kPa. Size of 11.36 mm x 10.32 mm. Modified calibration ranges available. 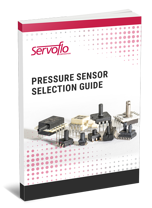 See all low pressure sensors offered by Servoflo. This is self-explanatory...Bookmark it for quick reference! For many negative pressure or vacuum pressure applications, 2 types of pressure sensors are available: gauge sensors or absolute pressure sensors. The reference pressure is the differentiating factor between these 2 types of sensors. The diagram below illustrates how the different methodologies work. 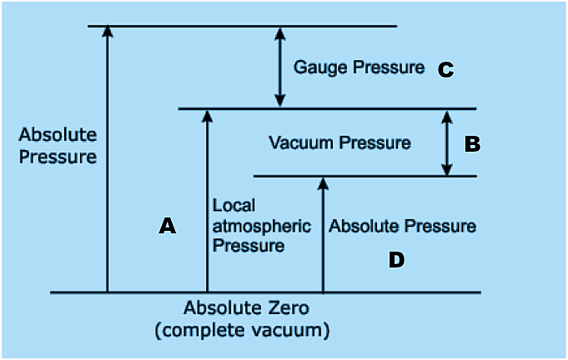 Absolute pressure sensors reference a vacuum, or zero pressure, and their full-scale pressure range is atmospheric pressure, which is about 14.7 psi at sea level (see item A). Hence, users have the capability of measuring up to negative 14.7 psi range of pressure. In the case of a gauge sensor, either a single port or dual port model can be used. In the case of a dual port gauge sensor, the "lower pressure" port measures the negative or vacuum pressure (B). By accessing the "lower pressure" port, the user is mimicking applying a positive pressure to the higher pressure port as in pressure range (C). The advantage of using a gauge sensor is if the user wants to measure a vacuum smaller than the full vacuum range 14.7 psi, such as -3 psi, using a lower range focusing on the negative pressure range is more appropriate. This way, by using a smaller full-scale range pressure sensor, the user captures the the full-range of the vacuum pressure measurements, thus obtaining more resolution and more design flexibility. 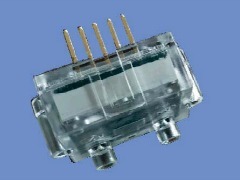 For a single port gauge sensor, the single port is vented to atmosphere. For example, if a user is trying to measure the inhalation pressure in a respiratory application, the pressure range would be no more than 0.6 psi. If an absolute pressure sensor is used, only 4% of the pressure range would be used, hence wasting 96% of the sensor's calibrated range. By using a gauge sensor such as the SM7XXX Series, the user can capitalize on higher resolution and measure smaller negative pressure ranges. Examples of classic applications where negative pressure measurements are needed include negative wound pressure therapy, breathing applications, pump control/performance monitoring, HVAC applications such as filter monitoring and pressurized rooms such as cleanrooms and isolation rooms. To learn more, we have an e--book, How to Pick a Pressure Sensor. We also have a Low Pressure Product & Pricing Guide which reviews specific models and includes budgetary pricing. 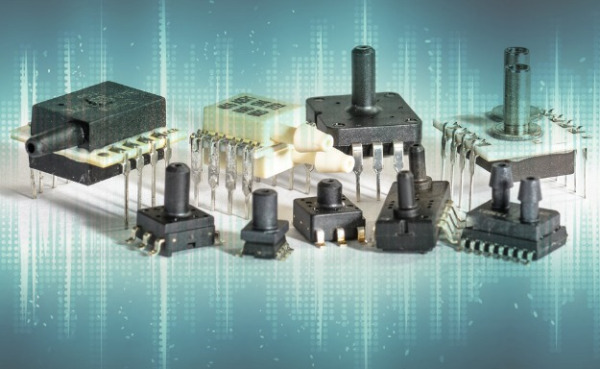 Why Choose Fujikura Pressure Sensors Over Freescale? 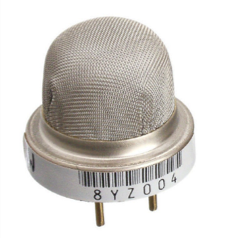 In the world of pressure sensors, users have a broad range of manufacturers and part numbers to choose from. Although detailed specifications on individual parts are easy to come by, we thought it would be nice to provide a comparison between the new AP/AG pressure sensors from Fujikura to various Freescale sensors, including the MPXV7025, MP3V5050(V)/MPX(V)5050(v), MPX(V)5100, and MPX5500. 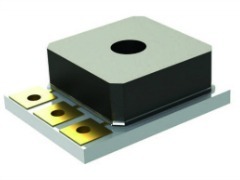 The following summary provides details on how Fujikura pressure sensors offer higher performance and more flexibility for users. More input voltage flexibility: All Fujikura AP/AG sensors come in a 3V, 3.3V or 5V supply. The Freescale sensors models listed above come in some but not all supply voltages. Pressure range choices: With a broad selection of ranges from +/-100 kPa up to 1000 kPa, Fujikura offers many more choices. Customization: In addition, Fujikura is willing to offer custom calibration and custom outputs in quantities that are normally too small for other manufacturers. Accuracy: Fujikura offers +/-1.5% full scale accuracy versus +/-2.5% or +/-5% for Freescale pressure sensors. Lower supply current: Freescale sensors require a 10 mA supply current. Fujikura, on the other hand, has a supply current of 3 mA for the 5V supply and 2 mA for the 3V and 3.3V supply versions. Fujikura's stocking distributor (yes, Servoflo) has over 30 years experience selling and providing technical support for Fujikura pressure sensors. Typical applications for these parts include sleep apnea, oxygen conservers, blood pressure measurement, ventilators, industrial applications and more. Our experience over the last 30 years selling Fujikura have shown that these pressure sensors are high quality yet cost-effective for customers. The ability to easily customize sensors for customers' specific needs is a powerful consideration when comparing pressure sensors. We are proud of our relationship with Fujikura and look forward to showing you why!